Reflexology is a non-invasive manual technique that helps support the body’s natural healing process. By applying pressure to specific points on the hands and feet reflexology aids in the reduction of tension and stress, promotes relaxation, aids in the detoxification process and helps improve circulation. According to the National Reflexology Board, “These techniques stimulate the complex neural pathways linking body systems, supporting the body’s efforts to function optimally.” Reflexology has been proven to help with migraines, digestive disorders, PMS, hypertension, post-operative pain, sinus congestion, and pain and anxiety associated with cancer and cancer treatments. 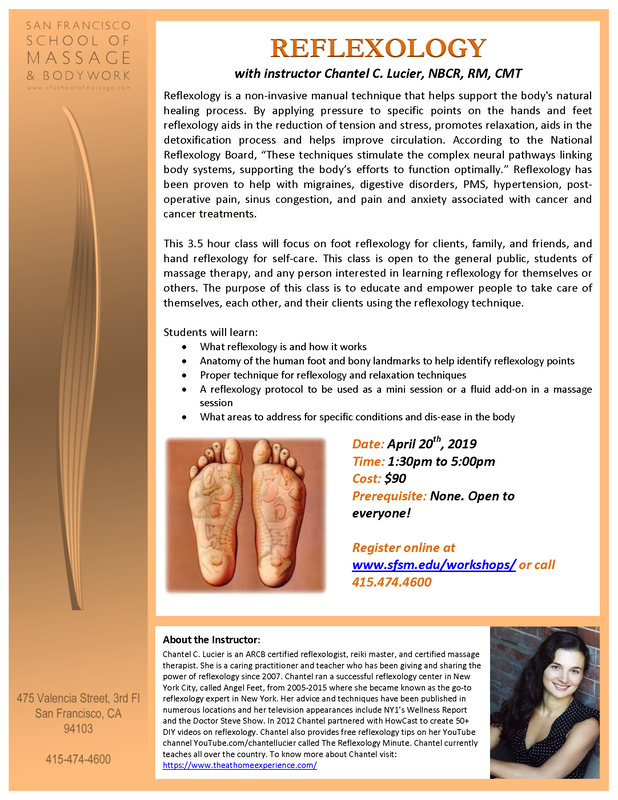 This class will focus on foot reflexology for clients, family, and friends, and hand reflexology for self-care. This class is open to the general public, students of massage therapy, and any person interested in learning reflexology for themselves or others. The purpose of this class is to educate and empower people to take care of themselves, each other, and their clients using the reflexology technique. What areas to address for specific conditions and dis-ease in the body. ​No prior experience or prerequisite needed. Open to everyone! Join me for a Book Signing at Corrick's! 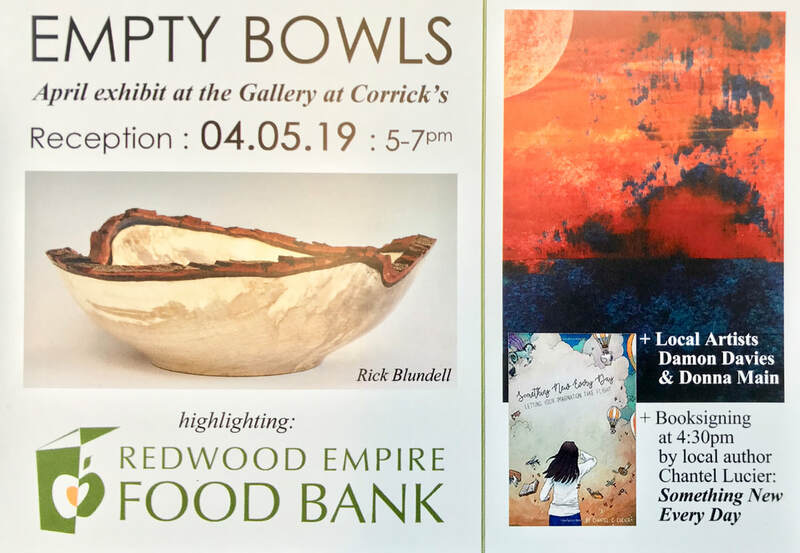 I'm very excited to share an evening with incredible artists, Rick Blundell, Damon Davies, and Donna Main, next Friday April 5, 2019 for my book signing of Something New Every Day: Letting Your Imagination Take Flight. We begin at 4:30PM. So, if you missed my last book signing in San Rafael, join me in Santa Rosa! 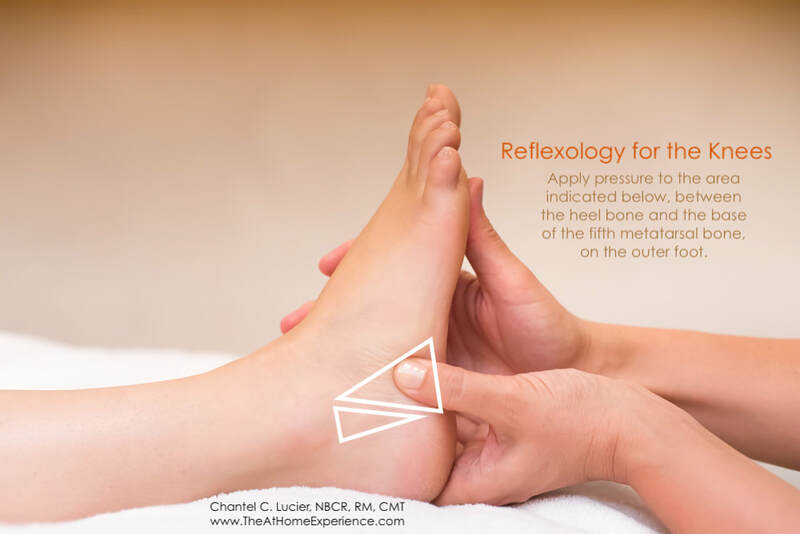 What reflexology area to press in your feet to help with knee pain, pre & post-surgical preparation, prevention, and care, and general knee health..
What reflexology points to press in your hands and feet to help maintain reproductive health. 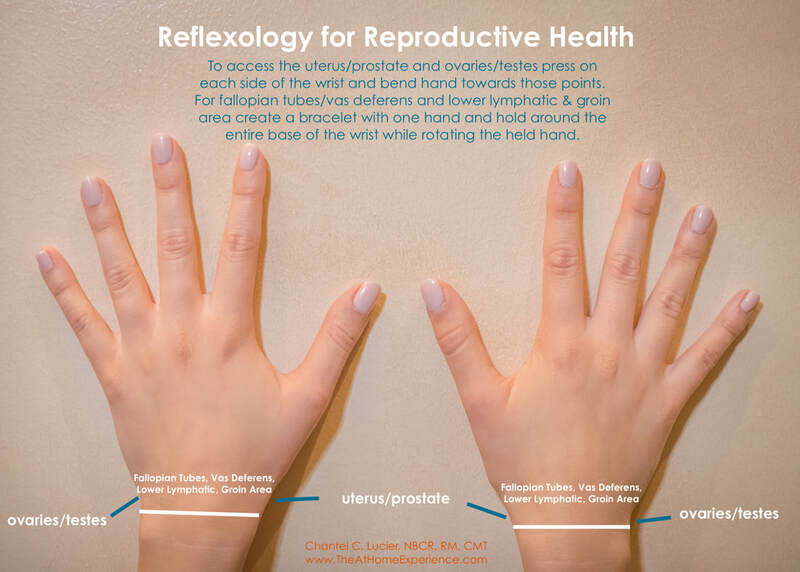 While there are many more reflexology points a reflexologist will address for specific conditions involving the reproductive system, these points are a great starting off point for general reproductive health self-care..
Click the YouTube video below to learn how and where to press. Something New Every Day - the book! 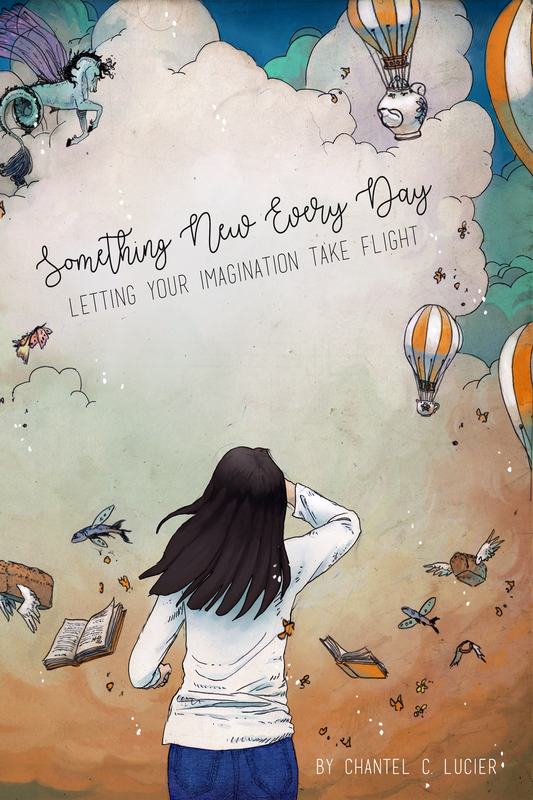 I'm very excited to announce my book, Something New Every Day: Letting Your Imagination Take Flight. Something New Every Day is a thirty-day exploratory journeying guide and journaling experience to activate your mind and ignite your daily life with purpose and passion. Every day for thirty days, you are invited to open up to a chapter in any order, and you will be asked to try something new. Carving out time every day to do something unfamiliar illuminates the parts of you that are open and the parts of you that are closed. Through taking the leap into the unexplored parts of yourself those stagnant places within you will free up and your connection to yourself, others, and the world around you will grow. May you feel stretched and strengthened and renewed. May you exit your comfort zone and enter the world with a fiercely open mind and heart! ​If you would like to purchase the book and join me in doing something new every day click HERE or on the book image below. 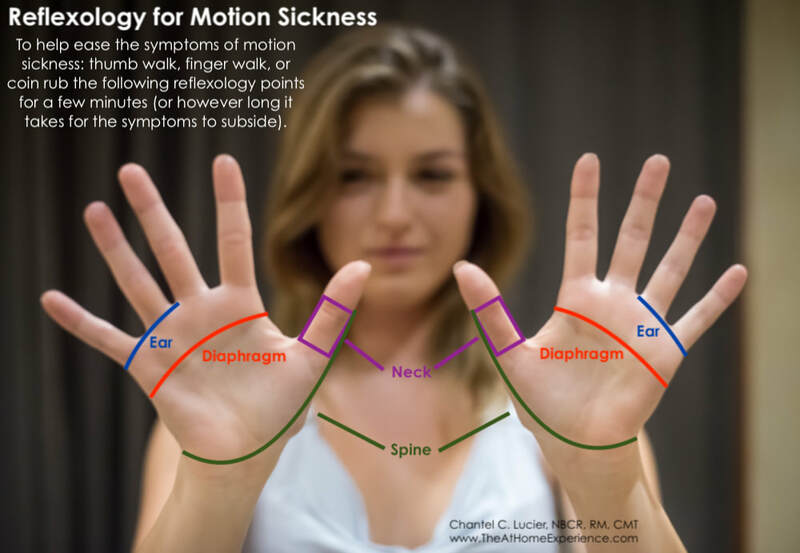 What reflexology points to press in your hands to help the symptoms of motion sickness. I travel at least once a month to see reflexology clients and students out of state. While I don't get motion sickness, I have met many a person on a plane that has benefitted from these points. So, whether you suffer from motion sickness or not, learn these points and put them in your back pocket should you ever need them for yourself or others. For clarity on where these areas are, refer to the photo below and watch the 58 second video! Reflexology does not claim to cure, diagnose, prognose, or prescribe and is not a substitute for medical care. 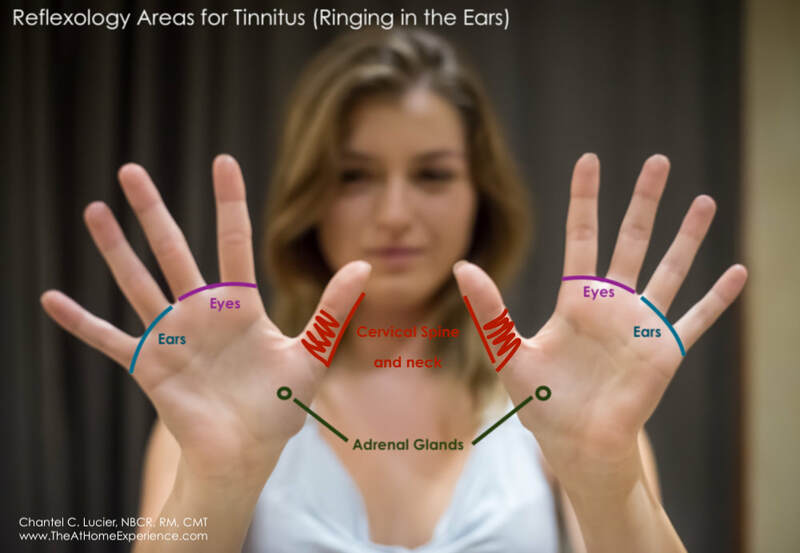 Hand reflexology points to help tinnitus. Tinnitus is generally experienced as a ringing sound. To some it sounds like a high or low pitched ringing, buzzing, or beeping. To others it might sound more like a whistling, swishing, buzzing, or even musical notes, The repetitive sounds can be maddening and for some it is present at all times. Here are some of the causes of tinnitus and what reflexology points you can press in your hands to help. Anything that increases blood pressure (i.e. caffeine, alcohol, stress). One of the resources I visit regularly is NIH (National Institutes of Health). NIH posted an article by the National Institute of Deafness and other Communication Disorders (NIDCD) that states, "[People] can develop tinnitus over time when ongoing exposure to noise damages tiny sensory hair cells in the inner ear that help transmit sound to the brain. This is called noise-induced hearing loss. Service members exposed to bomb blasts can develop tinnitus if the shock wave of the explosion squeezes the skull and damages brain tissue in areas that help process sound. In fact, tinnitus is one of the most common service-related disabilities among veterans returning from Iraq and Afghanistan... Even with all of these associated conditions and causes, some people develop tinnitus for no obvious reason. Most of the time, tinnitus isn’t a sign of a serious health problem, although if it’s loud or doesn’t go away, it can cause fatigue, depression, anxiety, and problems with memory and concentration. For some, tinnitus can be a source of real mental and emotional anguish." Read more here. I personally experienced tinnitus when I had developed really bad acid reflux. At the time I was receiving reflexology weekly but wasn't doing any self-care. I found that the sounds dissipated when I lost weight and eradicated the cause (acid reflux).. In a 2015 study The Hearing Health Foundation claimed that 48 million people in America and 360 million worldwide suffered from tinnitus. That's 1 in 5 teens, 1 in 5 adults, and 3 in 5 active and returning military. With so many people suffering from tinnitus, either on and off, or on a regular basis, these are important points to know should you or someone you know need care. Why we press these reflexology points. 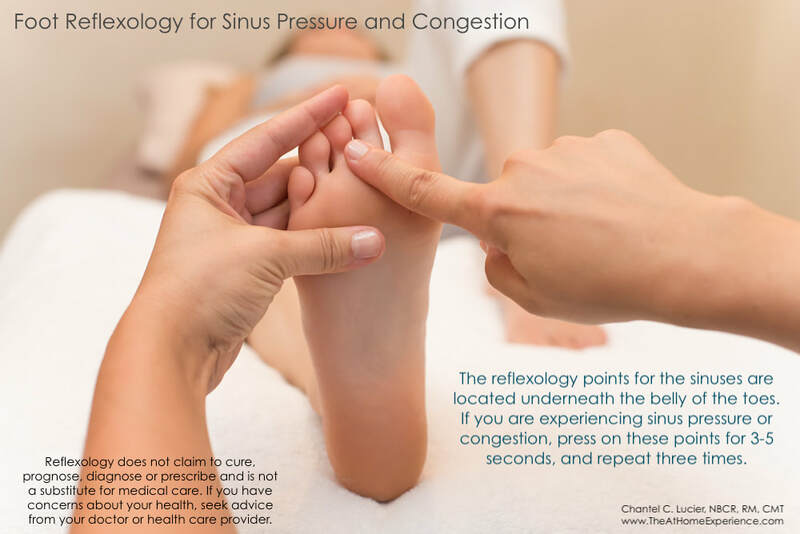 Whether you have sinus pressure, congestion, or are just feeling a little stuffed up, there are reflexology points you can press in your feet to help. What area to press for congestion in lung area. Due to wildfires and smoke, the air quality in Northern California right now is very unhealthy. People with asthma are having a particularly difficult time. And some people with no previous lung conditions or weaknesses are feeling tightness in their chests and developing a recurring cough. Living in Santa Rosa, the smell also conjures up a lot of feelings of despair and loss, as it was only a year ago that we experienced wildfires here. The people, the animals, the land. During this time I have been doing a few things to help with my sore and tired lungs. The Medical Medium's Metal Detox Smoothie has felt particularly good. 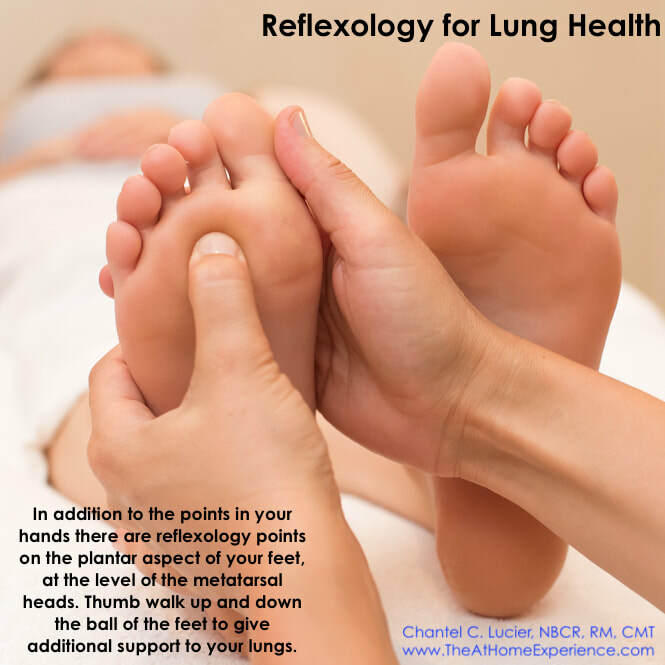 In addition to that I've been working on the reflexology points for my lungs. I have also addressed these points for all my clients. 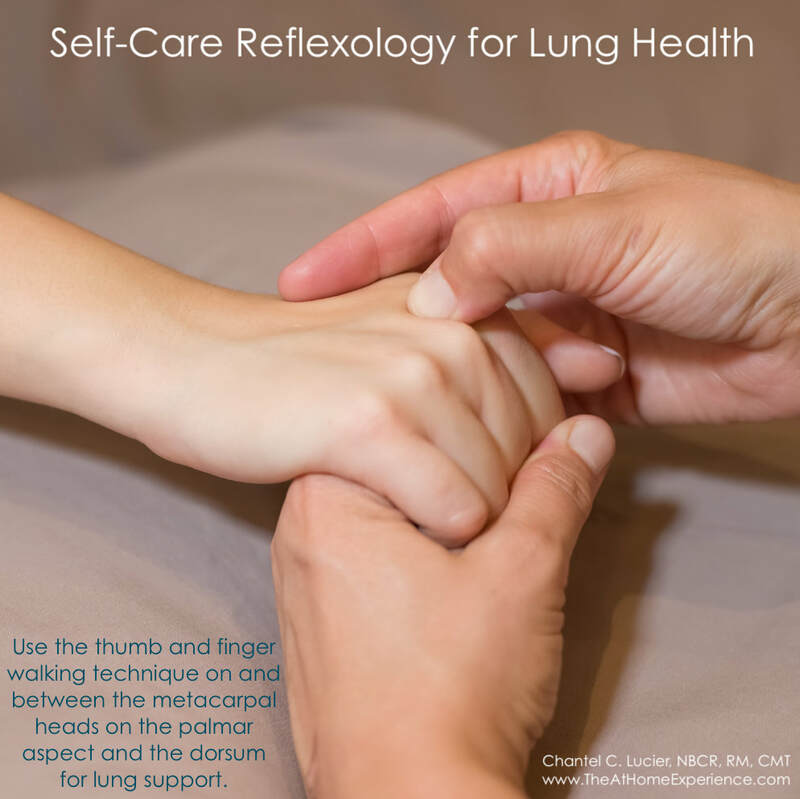 To address the lungs using hand reflexology you will thumb walk over the ball of both hands where the metacarpal heads are located. You can simply rub this area but it will be more effective to use reflexology technique. In this case, thumb walking is the best technique as it is very specific. Watch this week's Reflexology Minute for visual instruction on how to apply reflexology technique for the chest/lung area in your hands..